This topic contains 10 replies, has 3 voices, and was last updated by TimB 1 week ago. 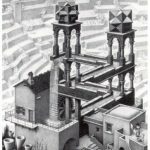 If we humans or even our future AI or our evolved future progeny ever develop time travel, wouldn’t they have visited our time, at least occasionally, during our currently recorded history? If they have, we have no sure evidence of it. Maybe they have, and it immediately wiped out their timeline. Maybe they have, but have been completely discreet about it. Maybe they could, but haven’t, because it’s a really bad idea. Or maybe time travel is just beyond homo-sapiens and their progeny to ever achieve. Maybe, since we’d have to discover how to travel through time a first time, we are on the initial run right now. In the future, after we know how, then we could travel back and bother our ancestors a first time. That would mean that we will exist again to experience the first time someone travels back to our time. But then this would lead to an infinite number of run-throughs of our lives to experience each new time someone travels back to visit us. This is one of those topics that is fun to think about for a bit, then it starts to hurt your brain. I don’t get it. If we learn to time travel for the 1st time next year, and travel back to now, how come our next year selves are not here already? Oh, wait, here I am. Oooh, must be a tuff upcoming year. Of course there are websites which claim that we ARE encountering time travelers from time to time (ha-ha). They dig up old, old pictures with people wearing odd shirts or holding a hand up against the sides of their faces and claim these people are using cell phones, or things like that. They can be pretty amusing. 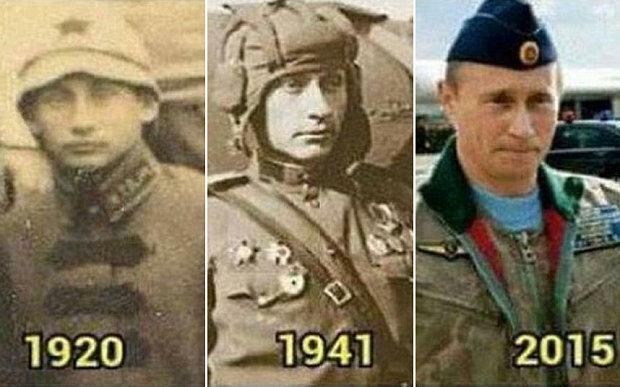 These pictures show Putin has traveled in time. 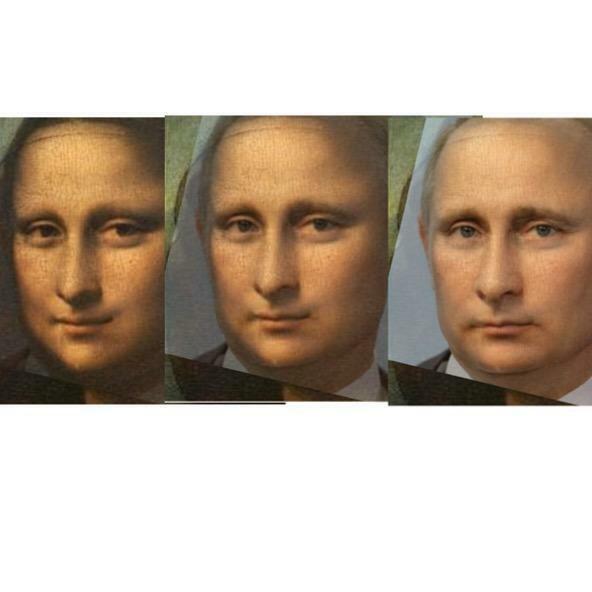 He even, at some point, goes thru gender reassignment transition and travels back in time to pose for the Mona Lisa. Oh my goodness. This is funny, but if the Simpson cartoonists predicted it 12 yrs before it happened, WTF? (seriously spooky) The only thing they got wrong was the black guy standing behind Trump in the picture, is a white guy in the cartoon; and one other background guy was a suit wearer instead of a Turban and robe wearer. This seems to be proof that Simpsons cartoonists can time travel. There are only so many faces when you think about it. I once bought a copy of Sir Thomas More’s “Utopia”, and the portrait of More on the cover is the spitting image of my nephew, Robbie. Think about how the invention of the airplane changed the world. There’s hardly any place on Earth that doesn’t have an airport, and as soon as you get airports you get hotels, you get tourist resorts, you get McDonalds and Burger King, everywhere. What the airplane did to culture the time machine would do to history, if such a thing existed. 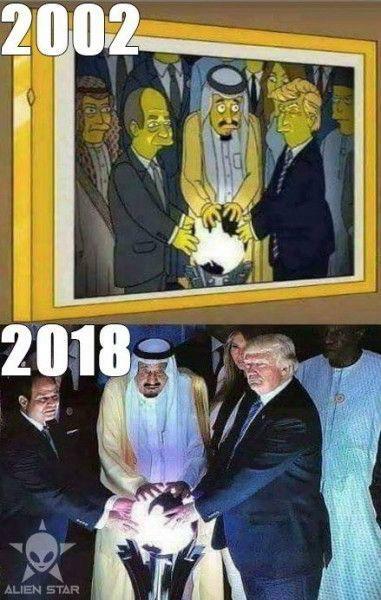 Are the Simpsons picture and the photo of Trump actually unmodified versions from 2002 and 2018 respectively? The globe that their hands are on is in the same orientation, Melania is in the same location in both (yet she didn’t marry the Dumpster until 2005 [I just did 10 seconds of research]), and even their body positions and how the light is hitting them is the same. I have no idea if the globe they’re fondling is a well-known item that is used like this fairly regularly, so maybe it’s not quite as unlikely as it seems at first. Does anyone have background on this eerie coincidence? Snopes saves the day again. Here is a video from the future, courtesy of AOC.